Yesterday was the Show-Me State Games/Midwest Fat Tire Series race at Rock Bridge Memorial State Park in Columbia. It was a great event. My significant other and I left Springfield at 7:30 and had a nice uneventful drive to the park. We arrived at about 10:30 and since I'd never ridden the trails there I registered for the race and went out for a nice easy lap to check out the course. My first impression was that it was going to be a very fast paced race. There were hills but it seemed like most of the course was flat. Very curvy, but pretty flat. Some of the interesting things about the course was a creek crossing with about 8 inches of water, about a quarter mile section on a gravel road and the trials through a couple fields. The rest was just good old fashioned singletrack. I finished my exploratory lap in about 50 minutes so I knew it was going to be a 3 lap race. The distance measured 8 miles on my bike computer; a bit farther than the 7 mile course at the Sac River race. There were a lot of riders for the various classes; 138 according to the race results sheet. As we gathered near the starting line for the 12:30 start for the expert and sport classes I met Rock Wamsley, the second place finisher in my class at the Sac River race 2 weeks before. He didn't pre-ride the course so I tried to give him a few tips of what to look out for. I hope it helped because he won the race pretty convincingly. When the race started there were 17 riders in the 30-39 sport group and I was in the second row. There was about a 50 yard sprint in a fairly wide lane on open grass before we turned into the single track. Having learned the lesson about hitting the trails in the middle of the pack at the last race I took off pretty fast and was in fourth place when we got into the woods. The rider in front of me as a pretty tall fellow on a 29er and for some reason he was slowing down quite a bit on the turns. The trail was pretty rough in that section but I hate slowing down on turns so I passed him at the first opportunity and spent the rest of the first half of the first lap passing the slower 29-under sport riders that started a minute ahead of us. They were all very good about giving berth to pass when I yelled that I wasn't in their class. In fact that was the case all day; nobody tried to block me like a few did during the Sac River event. During that lap I lost track of who was ahead of me in my class. I knew Rock was up there somewhere as he got the hole shot at the start and after about 10 minutes into the race I never saw him again, but I thought I was in second. About 15 minutes into the lap I was riding along on a flat section and started to take a drink from my camelbak. I must have hit something because I felt a jolt on my left foot and all of a sudden I was flying through the air going over my handle bars. It felt like it was in slow motion. I was just thinking, oh crap. Luckily I unclipped out of my pedals and landed in dirt on my right shoulder and nothing hurt, so I just jumped back on my bike and took off again. Nobody passed me and everything on the bike was functioning fine. Then on an uphill section in an open field I was passed by Jeff Yielding who was in my class. He was riding with another guy that wasn't in my class (didn't catch his name). I concentrated on Jeff and tried not to let him get away. He would put some distance on me on the uphills but when we got to the downhill and flat singletrack I was able to catch back up. About a mile from the end of the first lap we were riding on a flat section of the track weaving around the trees and I was right on Jeff's wheel. The trail took a slight left uphill bend with lots of big roots across the trail. He cleared the first root but when he hit the second one he did an endo and I rode right into him. It happened so fast I wasn't able to avoid him. I stopped after it happened and when I looked down he was all tangled up in his bike. I don't think he ever unclipped from his pedals. He said he was okay so I took off and finished the lap in 38:36. The second lap was the easiest of the race, looking at my time I realize that I slowed down a bit for that lap, I didn't think I was going slower but at the same place as the first lap Jeff and his buddy passed me again. I dug in and stayed on his tail and we talked a bit for the rest of the lap. Luckily he cleared the roots on that lap without indecent but he said he had lost his Garmen somewhere along the way. I finished the second lap behind Jeff with a time of 40:39. On the third and final lap I dropped off my camelbak and grabbed a bottle; it was a nice feeling getting the weight off my back. I stayed behind the 2 riders for about 10 minutes and got lucky on an uphill section. There was a fairly sharp turn and for some reason Jeff became unclipped from one of his pedals which caused him to slow down so I took the inside corner, hammered up the hill and passed both of them. I rode as hard as I could for the next couple miles and put some distance between us. When I crossed the creek around mile 3 I looked back and could only see the guy that had been riding with Jeff so I figured he couldn't be very far behind. After the gravel road when we got to the grassy part of the trial Jeff's friend was behind me and I was riding as hard as I could. He said "you know I'm not in your class" and I replied, "I know, I'm not worried about you". When we got to the section where Jeff had passed me the previous 2 laps I never saw him and I even passed somebody (from a different class). I kept going as hard as I could but I misjudged where end of the lap was and stood up and hammered up a hill when I thought I was nearing the end of the lap. I was about a half mile from the end, but I didn't know where Jeff was and I didn't want to get passed so near the end of the race. It was really strange because that last half mile was the hardest bike ride I've ever been on. My legs felt like they were on fire and my quads started to cramp. I wasn't out of breath but I felt like I didn't have any strength in my legs. Every time I pushed down on the crank I said to myself "I'm almost there". I must have repeated that a thousand times. It was like my body was saying stop but I kept telling it to keep going. I wasn't going very fast but I was moving. I finished the lap with a time of 39:23 for an overall time of 1:58:38. When I got to the finish line I rode about 15 feet and fell over and laid in the grass for several minutes. It was like I was in a daze. It felt good but I was exhausted. Turns out there were 2 riders in front of me; Rock won with a time of 1:54:55 and Zdenek Palecek got second with a time of 1:57:28; about a minute ahead of me. Jeff got fourth with a time of 2:01:19. I talked to him after the race and he said I passed him at the right time, I guess he burnt himself out trying to say with me and there was enough left on the lap that I was able to put over 2 minutes between us. 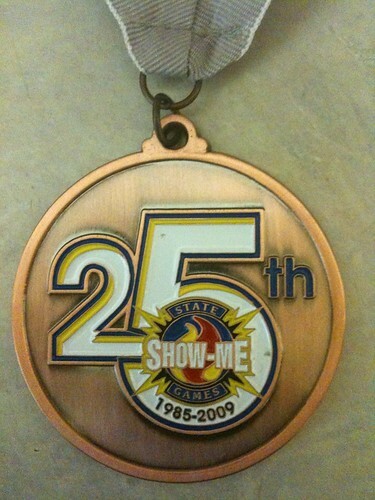 For third place I got a cool bronze medal (pictured below). The next race in the series is next Sunday (Aug 2) at Castlewood State Park. Rock said he isn't going to be in that race but I expect a huge turnout since it's right outside of St. Louis and there will be lots of locals. I've ridden there many times but there will definitely be a home field advantage for the people that ride there all the time. The hills will be brutal but at least they aren't taking us up cardiac hill or the one behind the gazebo. I'll be spending the weekend in St. Louis so at least I won't have to get up so early the morning of the race. I'm looking forward to it. You can likewise convey a light or hold gloves which will be valuable helpful hints to you while mountaineering.